This volume presents 18 narrations of the Temne in the Northwest of Sierra Leone. 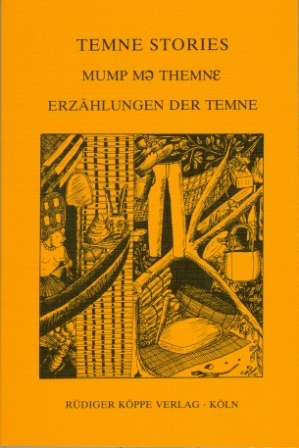 The English and the German versions were independently translated from the original Temne manuscript. They are free translations insofar as the translators aim was to reflect the literary beauty of the original texts rather than to give a true picture ot their linguistic structure. The style of the English versions does not necessarily correspond to Standard English. Since performances of Temne oral literature are highly dependent on the reaction and the active participation of the audience, verbal reactions of this kind have been rendered in the texts. The publication project was sponsored by the Cultural Department of the Ministry of External Affairs of the Federal Republic of Germany. Since oral art has died a silent death in many parts of Africa over the last decades, the editors want to contribute to the conservation of oral tradition in Sierra Leone which is evidently an exception to the general trend.